Microsoft recently unveiled its new “stack marketing“ system, at the Martech Conference in San Francisco, California, as part of the Stackie Awards. While I could easily talk about how happy Sociabble is, to have a highly coveted spot as a member of this stack, I would rather explore the many insights we can gain from this system. In particular, those of Microsoft as a company, their marketing strategy, and the implementation of win-win technology partnerships. Stack marketing is an ensemble of tools; an organized group of solutions that are deployed to respond to a company’s needs. With stack marketing, you need an understanding of multiple marketing tactics, and a range of marketing tools. Both of which are constantly evolving. When you fail to evolve with them you lose your competitive edge and could fall behind. Microsoft’s stack is a clear example of how stack marketing, when done correctly, helps you stand out from the crowd. Microsoft selects the tools that it considers to be the best adapted to help a company achieve its objectives. Even if the best tools are provided by competitors or aimed at other industry sectors; For example, within the stack you can find Salesforce Marketing Cloud, a direct competitor of Microsoft Dynamics. Instead of shying away from competitor tools, Microsoft embraces them. Just as in Judo, using an opponent’s strengths to your own advantage is an integral of Microsoft’s strategy. 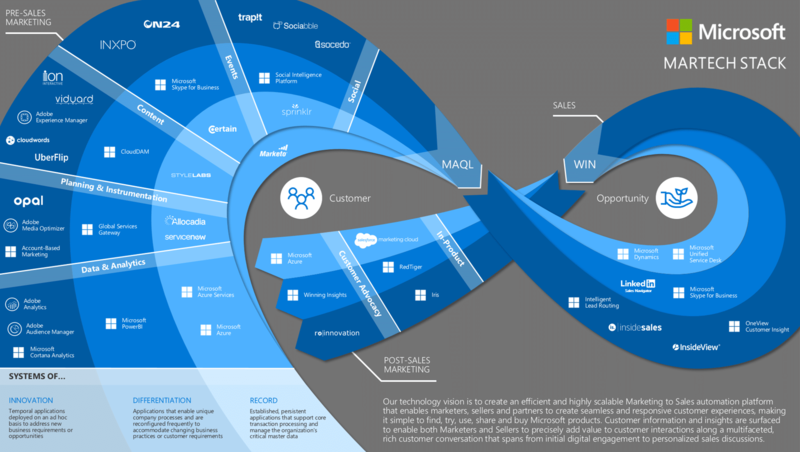 While Microsoft embraces competitive tools, they also build lasting relationships with the technology providers present in this marketing stack. Most have chosen to host their solutions on Microsoft Azure to be better integrated into the system and respond directly to Microsoft’s needs. Azure also provides easy access to Microsoft’s client ecosystem. Many marketing heavyweights have chosen to invest in Azure, including: Adobe, Sprinklr and Salesforce, to name just a few. The complexity of marketing activity makes the choice of a single tool impossible. The Microsoft stack demonstrates a willingness to address all needs by combining solutions from clients of varying types and sizes. This is done strategically. The dark blue wave represents innovative and forward-thinking solutions, often developed by small companies with more flexibility than larger names. This enables Microsoft to stand out from, and get ahead of the competition. The closer we get to the light blue wave, the closer we get to the company’s “spinal column”; a system that manages critical data and reference documents. Microsoft combines solid foundations, such as data and content repositories, with agile solutions that address rapidly evolving needs. The interoperability of these solutions is essential; requiring single sign-on and data exchange capabilities to make it into the stack. The magical thing about this approach is that it is nearly 100% Software as a Service, with billing calculated in terms of licenses. Therefore, smaller companies can implement a large amount of the solutions by Microsoft. For example, Microsoft currently deploys Sociabble in over 50 countries, while some of our smaller clients have launched the platform for 100 users. The same is true for almost all the solutions present in the stack. The Microsoft stack also covers sales activity. The wall between marketing and sales is now a thing of the past. Everything from account based marketing, to social selling and the alignment of marketing automation and CRM systems, is a part of the vital fusion that is built upon data and the consolidation of contact points; whether in the context of marketing campaigns or sales prospection. From lead generation to the closing of deals and client nurturing, the marketing and sales cycle is one that involves transverse solutions from start to finish. Very few companies prepare to unveil their full technology ecosystem this way. The selection of every tool takes a great deal of work, and time. The ability to understand that a specific selection of tools work well in unison is incredibly valuable. Now more than ever, Microsoft has opted for openness in what they do; demonstrating that they are not afraid, they are confident in their choices, and they are leading the way in stack marketing. Jean-Louis Bénard is the CEO and Founder of Sociabble, a leading provider of advocacy and engagement solutions. In 1994, he founded the digital agency FRA, growing the company until Digitas acquired it in 2001. During this time, he was also actively involved in the setup of the first e-commerce platforms in France, including Ooshop. Since 2003, he has been at the heart of the European internet ecosystem, as a founder and now Chairman of Brainsonic. With over 120 people, Brainsonic is a leading digital communications agency, specializing in Content Marketing and Social Media. In 2014, he launched Sociabble, a software company dedicated to delivering top of the line, enterprise social media solutions for brand advocacy. With a solid foundation and offices across the globe, Sociabble is currently experiencing the same rapid growth and expansion of Jean-Louis Bénard’s previous work.